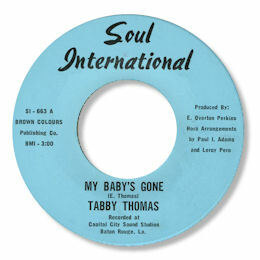 Ernest "Tabby" Thomas may not be a name that springs readily to the mind of a soul fan. 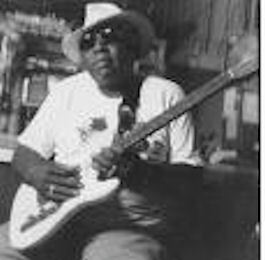 But although he is best known as a quality purveyor of that special brand of small band blues that Louisiana is justly famous for, in his long and distinguished career he tried his hand at many other styles including southern soul and it is his neglected recordings in this genre that I'd particularly like to highlight here. Thomas was born on 5th January 1929 in Baton Rouge, LA where he was raised. He cut his first recordings in the 50s for Delta and Feature before joining the premier blues producer in the locality Jay Miller. Of his releases around the turn of the 60s I rate the fine New Orleans flavoured "Tomorrow" a really good piece of swamp pop, the stop go blues of "Hoodoo Party", and the rocking "Popeye Train" as my picks. 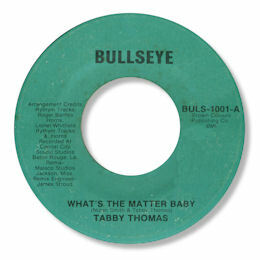 By the mid 60s however the enterprising Thomas was moving away from R & B towards soul music recording such fine songs as I Say which rather surprisingly didn't get a 45 release at the time . Now you could never mistake Tabby for a singer who'd spent years learning their trade in a gospel church but he does get up a fine head of steam here. Cracking band too. Into the early 70s he made several fine soul 45s which deserve much greater appreciation. He often worked with Ed Snead and Lionel Whitfield, who owned the local Whit label, recording mostly at Capital City Sound Studios in Baton Rouge with the product appearing on a variety of tiny local labels, often owned by Thomas himself, or surprisingly on obscure New York concerns. The only disc from this period that has garnered any soul attention at all is the savage strutting funk of "One Day" but the flip My Baby's Gone is a very strong slab of deep soul with some great guitar figures and a lovely horn arrangement. "You're All I Got" is a midpaced soul song of considerable charm with Tabby essaying a higher register vocal and a tidy little rap in the middle. Better is the blues ballad No Use Anymore which has great "muddy" sound to it with horns and a good female chorus. Love the guitar/piano interplay in the bridge. The four songs which made their way onto Vedette in New York are all strong. Perhaps the best is the very fine ballad There Ought To Be A Law which has some great chord changes , gently toned horns and a fine organ tying it all together. 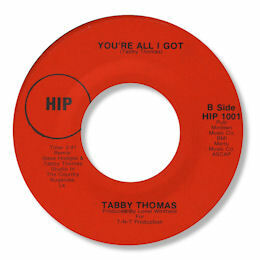 I like the midpaced "Love Is The Name Of The Game" partly because of the great groove the band strike up but also because of Tabby's laid back vocal. So cool! The terminally obscure Bullseye release is another worthy soul effort. "Sugar Daddy" is a plodding beat ballad of considerable merit and "What's The Matter Baby" has an even better feel to it. Great fat horns lead Tabby through the chords and there is even a touch or two of "flying cymbals" from the drummer. Disco blues! In the later 70s Tabby started his longest running label Blue Beat. Al though most of the output was blues oriented there were some other s like the funky hoodoo of "Luck's Got To Change" and the soulful toe tapper "All For You" my favourite of his later cuts. 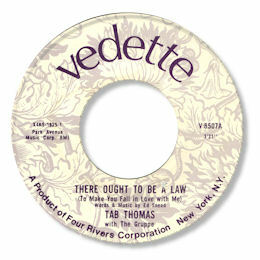 The most interesting Blue Beat 45s were issued under the name T-Boo. It's possible that these discs are really Tabby in disguise but the vocalist doesn't sound like him to me and unlike almost every other Blue Beat track they don't appear on any of the compilation CDs that Tabby issued recently. So my conclusion is the T-Boo is a different artist. Tabby continued recording the occasional soul number right up to the start of the 80s. The best that I've heard is the fat chunky beat of Leave It Like It Is on which Tabby puts out what might just be his best ever vocal. Around this time the ever enterprising Thomas opened up Tabby's Blues Box which quickly became Baton Rouge's premier blues venue attracting not just the cream of the local talent but also touring stars as well. Tabby continued making music right up to a major stroke in 2004 which sadly seems to have ended his career. But his rich musical heritage - one of the most formidable in Louisiana - will live on. UPDATE ~ Dante Carfagna has added the Hartco-Golden 45 to the discography. As ever I'm very grateful to him. Note ~ There are Tabby cuts on several Ace UK compilations including "One day" on "Southern Funkin'", "Popeye Train" on "Louisiana Roots" and "Keep on trying", Mr Buzzard" and "Say I" on "Blues For Hippies". "Hoodoo party" can be found on "The Excello Story Vol 4". Special thanks to Andy Aitchison for help above and beyond. Thanks to Joseph Keppel for the correct date of a 45 in the discography.